A young man injured his back. The injury was life impacting. Been in a Car Accident? Act Fast. 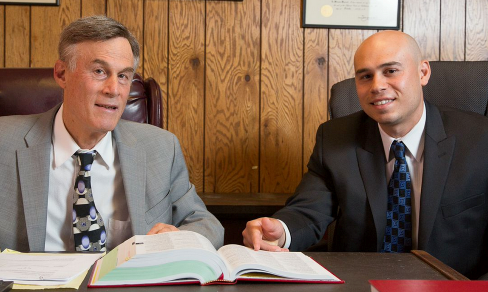 Schreck Law, Newark Car Injury Lawyers have be defending the rights of car accident victims for over 30 years. Our lawyers have recovered over $30 million dollars for victims. A man fractured his ankle when he fell down stairs. He is forced to walk with a cane the rest of his life. Been in a Slip and Fall Accident? Act Fast. Our Slip and Fall Injury Lawyers have been standing up for the rights of accident victims for 30+ years. Our slip and fall lawyers have recovered over $30 million dollars for victims. A man injured his back lifting tarps suffering a herniated disc. Injured at Work? Act Fast. Our Workers Comp Attorneys have been representing injured workers for over 30 years. Our workers comp lawyers settled 100s of worker compensation cases for injured workers. Schreck Personal Injury Lawyers is a general practice law firm that was established in 1982. The firm was started by Fredrick Schreck, and his son Jarrett Schreck joined him at the firm in 2009. Conveniently located at 575 Dr. Martin Luther King Jr. Blvd. in Newark, NJ the firm is just two blocks from the Essex County Courthouse. The Schreck Personal Injury Lawyers specializes in auto accidents, slip and fall injuries, premises liability injuries, workers compensation, pedestrian accidents, drunk driving accidents, and wrongful death accidents. We offer a free consultation, and there is no fee unless we recover money for you. A car accident is a very serious matter. Victims of automobile accidents are entitled to be fairly compensated for their pain and suffering. After an accident, clients typically have many questions, such as what medical treatment is covered by insurance and if they are entitled to lost wages. Also, clients want to know what they have to prove at trial to recover for their pain and suffering. While answers will vary in every case, after an accident, it is important that you file a police report, and contact a car accident attorney immediately, who can answer your questions. Property owners and business owners have a responsibility to keep their property safe for tenants and invitees. If you have suffered a slip and fall injury, you may be entitled to compensation for your pain and suffering. Common slip and fall accidents we have settled involve negligent snow removal, slip and fall injuries in grocery stores or department stores, and steps not constructed according to code or steps without a handrail. If you have suffered a slip and fall injury, act quickly and contact our law office for a free consultation. Employees that are injured on the job are entitled to workers compensation benefits, regardless of who was at fault for the accident. Employees are entitled to temporary disability for time missed from work, permanent disability which is an award that compensates the employee for injuries, and medical treatment. If you have suffered an injury at work act quickly and contact my office for a free consultation. Essex County and Newark are heavily populated areas with many people traveling by foot to their desired destinations. Unfortunately, many drivers do not pay attention and strike pedestrians while they are crossing the street or standing at the corner. If you were struck by an automobile, act quickly and contact Schreck Personal Injury Law Firm for a free consultation. If you or a family member was injured on another's premises due to negligence or negligent security act quickly and contact Schreck Premises Liability Lawyers for a free consultation. If a family member has suffered death as a result of an automobile accident, truck accident, medical malpractice, work accident, or construction accident, contact our office for a free consultation. A drunk driving accident is a very serious matter, and often personal injuries are severe for victims of drunk driving accidents. A drunk driving is against the law and an accident would have been prevented if responsible actions were taken by the driver. If you or your loved ones were involved in an accident with a drunk driver, contact Schreck Injury Lawyers for a free consultation. Schreck Law Office serves the following cities and the surrounding areas.